Compass Communique has been mailed USPS two to three times a year to those who have purchased DVDs/CDs, attended a Steeling the Mind Conference, traveled with us, donated or have requested below to be sent for free. Scroll down to see past Communique Articles. 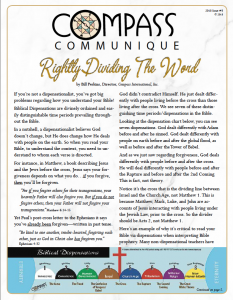 Please Note: MOST of our communication is now done though the FREE Compass eNews and we highly recommend you sign-up. Ready for the ‘Mark of the Beast’? What if Rapture is 20 Years Away / The Death of the Dollar? The Magic of 666; Timing of Rapture!